This Tank was put together by "Cardboard Sculptor" Bob. 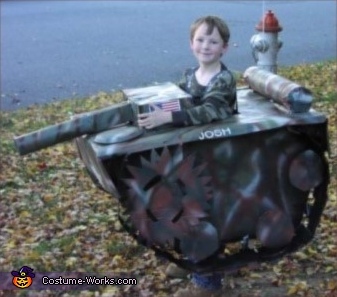 On my "Homemade Costume" pages you can find "How to's" from Bob, about this home made Tank costume and some other great costumes. The military industrial complex should not be confused for patriotism. Cute kid, though; hopefully he doesn't get sent off to war to make money for the special interests.